We enjoy our orchids when they look their best. We love beautiful arrangements when we go to shows and see the exhibits. With a desire to increase our personal enjoyment and with show season upon us, we will be looking at techniques to have our plants present their beautiful blooms to their best. Tips on staking, plant grooming and small table top displays will also be covered. Join us on Wednesday, October 5th for this interesting presentation by our President, Arthur Pinkers. Arthur has been an orchid enthusiast since the age of sixteen, when he acquired a plant of Slc. Glittering Jewel (Sl. Gratixiae x Slc. Hermes), which infected him with the orchid bug. His forty plus years of experience growing orchids started in the Pacific Northwest with a greenhouse to fend off the cold, rainy days, but a decade ago a job change forced him to move to Santa Clarita, California, where the conditions are extreme for growing orchids. Growing up in the Seattle area, Arthur attended Western Washington University in Bellingham, Washington, graduating with a B.S. in Chemistry and Biology. He worked for many years as a chemist, and had the fortune of having his dream job as the Lab Director for Beall Orchid Company until shortly before its close in 1990. Despite not having a current career working with orchids, Arthur has taken an active role in the orchid community. He has been an Accredited Orchid Judge for over twenty years and has served in most executive positions on the Board of the Northwest Orchid Society, including serving as President from 1988 to 1989, and as a center photographer for the Pacific Northwest Judging region. Currently, Arthur serves as the Center Judging Chair at the Pacific South – San Marino Judging Center and one of the photographers for the Pacific South Judging Center. Though he has an interest in a wide variety of orchids, botanicals are a special draw to him for their diversity and charm. Arthur has been married to his wife, Margie, for over twenty-seven years, and has two adult children. While they have not inherited his knack for growing orchids, his family enjoys the beauty and wild aromas his backyard jungle brings to their home, a respite from the desert landscape around them. The American Orchid Society recently granted awards at the Pacific South Monthly Judging in San Marino which was held at the Huntington Botanical Gardens. This photo was taken by Arthur Pinkers. Award of Merit – 80 pts. Topic: Growing your best orchids at home! This is a meeting you won’t want to miss. Our next SFVOS meeting will feature a panel of experts who will give you all info on how to get the best results from your own orchids at home. Our panel of experts will be AOS Judge and our new president, Arthur Pinkers, Orchid Expert and cymbidium grower extraordinaire, Art Mendoza and our new Vice President and long time orchid grower, Mark Bentow. The panel will discuss the best way to keep your orchids healthy, how to water and fertilize each type of orchid, how and when to report and how to coax your orchids to re-bloom. Bring your questions, and if you have a plant that needs special attention, bring it to the meeting and ask our experts what to do to bring your plant back to optimal health. Don’t forget to bring your blooming orchids to show in our Plant Forum, and if you can, bring a snack to share with the group. Bring a guest, and we will see you there! Orchid educator Doug Overstreet, considered by some to be a “man of all orchids,” will present the program when the San Fernando Valley Orchid Society meets at 7:00 p.m. Wednesday, February 3rd, 2016 at the Sepulveda Garden Center. The program is free and open to our members and to the public. Doug will be speaking about the care and feeding of orchids. He will be demonstrating re-potting techniques, and giving us all his tips and tricks to help our plants be healthy and beautiful. Many of you already know Doug as our interesting and knowledgeable auctioneer at our annual orchid auctions. His encyclopedic knowledge of orchids and lively banter always make for a great orchid auction experience. Doug Overstreet was born and raised in New Mexico. He is a descendant on both sides from a long line of farmers and is the son a floral designer, so he comes by his interest in orchids naturally. Overstreet began growing orchids at the age of 10 and said he has been avidly involved in the hobby ever since. He continued his love affair with orchids after moving to California in 1975. In 1984, his collection began to grow by leaps and bounds, and he now maintains a mixed collection of approximately 1,000 plants. Overstreet also became an active participant in the local orchid community. 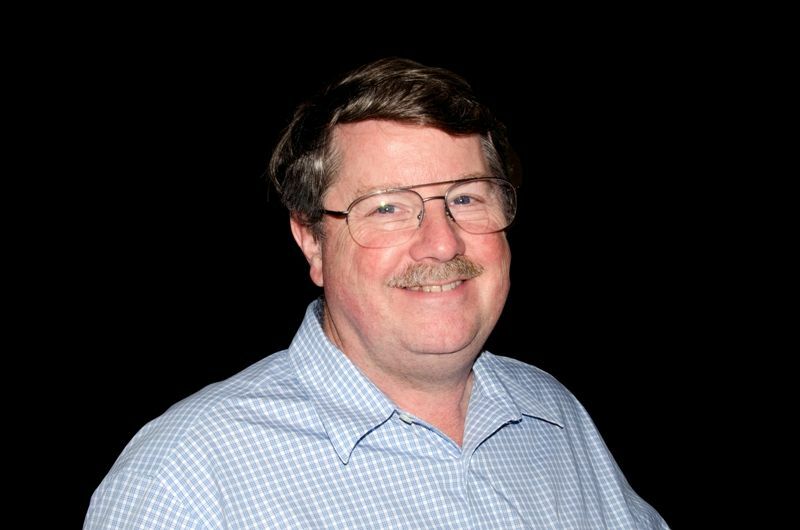 Over the years, he has served on the board of the Orchid Society of Southern California, and he is a past president and board member of the Southland Orchid Show Committee. He is a former ribbon-judging chairman for the Orchid Society of Southern California and is an accredited American Orchid Society judge in the Pacific South Region. A frequent lecturer on orchids and related topics, he has spoken for numerous orchid societies, botanical gardens and orchid nurseries. He is noted for his ability to present complex information on orchids clearly, concisely and in a manner suitable for the advanced enthusiast but also easily understandable by the beginner. Overstreet has written articles for Orchid Digest and has served on the editorial committee of that publication as assistant editor. He lives in the Glendale area and owns and operates Nature’s Bounty Orchids, a small nursery serving the Southern California hobbyist and gift plant community through local certified farmers’ markets. Although I teach middle school kids for a living, one of my passions has always been plants. I began growing orchids as an offshoot from working at Longwood Garde ns in Philadelphia just after college. From the very beginning it was all about Paphs, particularly awarded and select clones of historic importance, of which my collection numbers nearly 1000. While I love finding old, rare stepping stones in paph breeding, I also do a little hybridizing of my own, and growing up my own babies is a blast. I enjoy making my culture the best it can be, and I have had numerous experiences with professional growers in California and on the East Coast, which has helped tremendously. I am the youngest accredited judge with the American Orchid Society, and have served in various capacities with local orchid societies. I love meeting other people who like orchids too, and doing so often finds me traveling to shows, vendors, and peoples’ greenhouses to see the latest and greatest in new hybrids and to get the best orchid gossip. I like to be involved in plants as much as possible: in addition to Longwood, I’ve worked at the Smithsonian Institution tending to their orchids, and for years for the United States National Arboretum, collecting rare plants and documenting cultivated species and hybrids for their herbarium. For your meeting, I’ll be sharing a presentation on recent advances in Lycaste breeding, culture, and growing. These plants are easy to grow and flower, are vigorous, and have low demands on culture, and as such are wonderful plants! Tremendous advancements in breeding Lycastes have been made recently, and I will share some of these with you, as well as help identify some of the important species in the backgrounds of historically important and modern Lycastes. By the end of this presentation, you will have a new appreciation of what goes into breeding trends for these types of plants, as well as an appreciation of their beautiful flowers and ease-of-growth. I will be providing a plant table of the newest, modern, cutting-edge Lycaste breeding, with both blooming and un-bloomed plants. Please join us Wednesday, October 1st at the Sepulveda Garden center to hear Dr. Geiger’s talk and watch his PowerPoint presentation on this interesting subject. Oberonia is a literally and figuratively overlooked genus of orchids with minute flowers. Daniel has become interested in this genus with some 150-300 species. An overview of the genus is provided, including many never seen before images taken with light and scanning electron microscopes. Most specimens available in the trade are misidentified; the process of checking the identification of a plant is detailed. Approaches to experimental culture of oddball orchids rounds out the presentation. This may be particularly interesting to growers who want to expand into under-appreciated orchids, or may be tempted with small research projects. 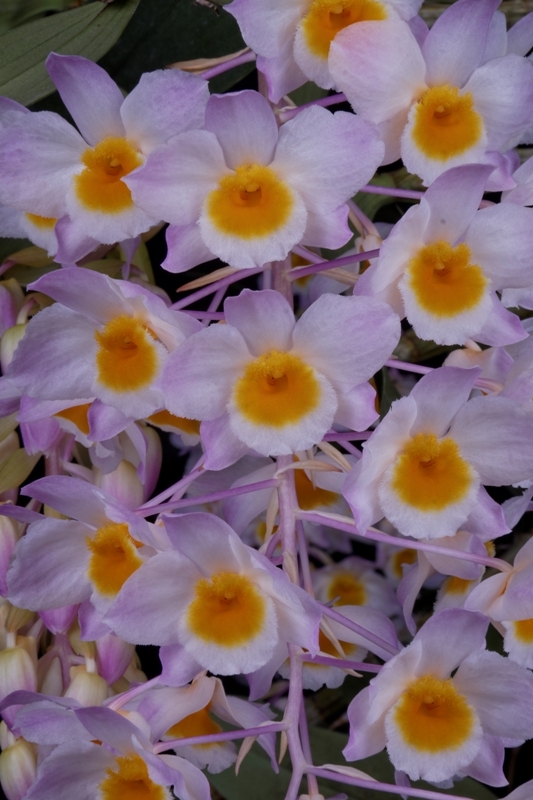 We are pleased to announce that the San Fernando Valley Orchid Society will be holding it’s annual Orchid Auction on Wednesday, April 2nd, 2014. 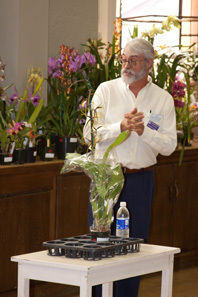 We were very lucky to get orchid expert, Doug Overstreet, to be our auctioneer again this year. It will be held at our normal meeting place, the Sepulveda Garden Center. Plan to arrive early as the doors will open at 6:45 pm so the bidders can take some time before the auction to preview the plants and mark down the numbers of their favorites. This is your chance to bid on good plants and raise money for the SFVOS. These funds pay for next years guest speakers and their amazing programs. Door open at 6:45 pm and the auction will begin at 7:00pm. Please check out our new menu item featuring the AOS Monthly Checklists. The current issue covers March and April. These checklists are designed to help hobby growers learn how to care for their orchids in every season. Each checklist features several types of orchids, and explains what is going on with them at this particular time of year, what we should be watching out for and what practices to adopt and/or avoid at this time. There are six of these checklists a year. I hope you find them as helpful as I do. Enjoy. Mark your calendar. The Santa Barbara International Orchid Show is almost here. It is always a great show with beautiful displays of every type of blooming orchid put together by Orchid Societies and Orchid Vendors. There are classes taught by experts and there is a huge room filled with vendors selling orchid plants and supplies. If you haven’t already visited this show, it is definitely worth the short drive to Santa Barbara. Additionally, many of the Orchid growers that are in or near Santa Barbara hold Open Houses that same weekend so you can drop by the various greenhouses and see where the orchids are propagated and grown. Mark your calendars. You won’t want to miss these great events. Mark Your Calendars for this Special Event.